I read these two sentences over and over again and I got chills. This really must be the universe reminding me that as I am going through a challenging time, I must trust that staying present in this discomfort will result in something greater. Well, here I am at 31 slowly building my dream life and career, while being confronted by the financial challenges (and sometimes grim realities) of a freelancer/independent contractor. By the instability of a schedule that is in constant flux with ebbs and flows, gains and losses. I am constantly reminded of impermanence and that nothing is guaranteed. And then I notice how do I deal with the reality of impermanence? How do I approach it with love, grace, and compassion? I approach these challenges with love, grace, and compassion by keeping the faith and by trusting. I have Faith that when it feels like everything is crumbling and dissolving, there will be an equal amount of rebuilding and resolving. And that when I do eventually get to the other side I will have a laugh at how discouraged I once felt. I Trust that it’s ok to ask for help. I trust that when I ask for help people won’t run away and that it’s ok to cry when I feel like my small little world is falling to smithereens. I Trust in the support of a loving community of heart-driven people. I Trust in myself that “I can do this” and that “I have my own back” as does the universe and said community. 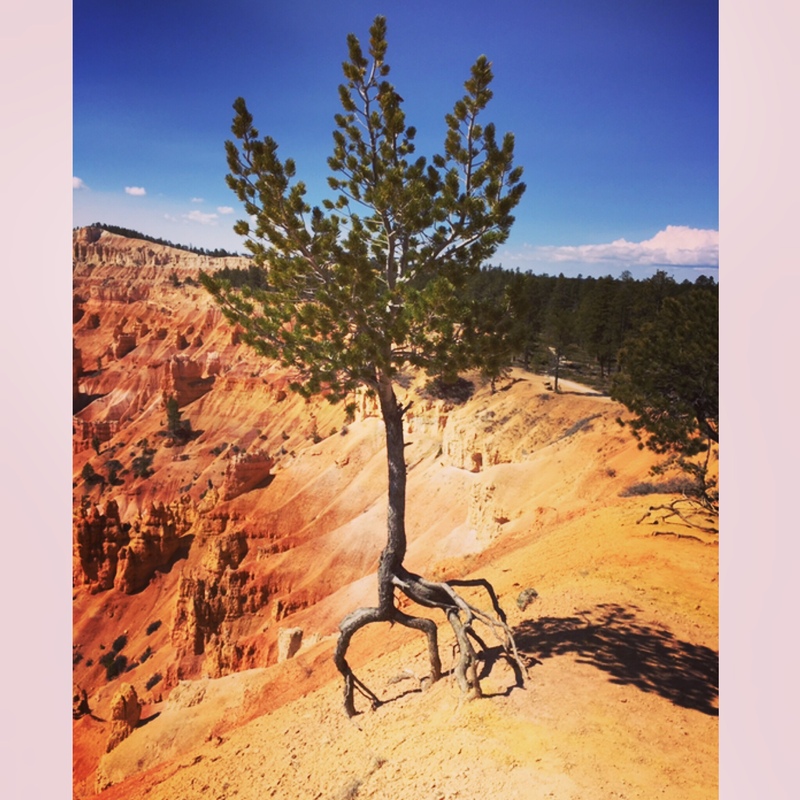 When I visited Bryce Canyon National Park last weekend there was a beautiful tree as we neared the end of our hike: the Limber Pine. You can tell by it’s exposed sprawling roots, unprotected by earth, that this tree has been through hell and back again. And then I read about the tree, about how they are resilient and can grow on the edge of cliffs, exposed to erosion and the elements, but deeply connected by their strong tangle of roots. I resolved then and there that as I go through the challenges I am currently faced with, I want to be resilient like the Limber Pine that surely goes through struggles but allows it’s branches to bend and sway so that it can then stand upright and elegant time and time again. My friend was right, I can’t think of a time that I’ve taken great strides when I’ve been all warm and comfy. And don’t get me wrong, there’s nothing I love more than being warm and comfy. Except maybe welcoming the opportunity for change.